Downtown Location on Post St.
Do I Have to Get Fitted for Contact Lenses? 25 Nov Do I Have to Get Fitted for Contact Lenses? Contact lenses are a great alternative to wearing eyeglasses. If you choose contact lens wear for your vision correction, it is very important that the lenses fit properly and comfortably and that you understand contact lens safety and hygiene. A contact lens exam will include both a comprehensive eye exam to check your overall eye health and general vision prescription and then a contact lens fitting. Corneal Curvature – In order to assure that the contact lens properly fits the curve of your eye, your doctor will measure the curvature of the cornea or front surface of the eye. The curvature is measured with an instrument called a keratometer. If you have astigmatism, the curvature of your cornea is not perfectly round and therefore a toric lens, which is designed specifically for an eye with astigmatism, would be fit to provide the best vision. 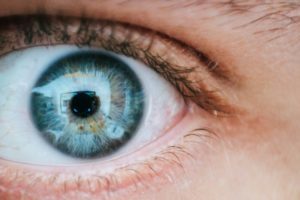 Pupil or Iris Size – Dr. Mosaddegh may measure the size of your pupil or your iris (the colored area of your eye) with an instrument called a biomicroscope or slit lamp or manually with a ruler or card. This measurement is especially important if you are considering specialized lenses such as Gas Permeable (GP) contacts. Tear Film Evaluation – A common problem affecting contact lens wear is dry eyes. If the lenses are not kept adequately hydrated and moist, they will become uncomfortable and your eyes will feel dry, irritated and itchy. A tear film evaluation will assess the amount of tears your eyes produce. The amount of tears you produce will determine which contact lens material is best for your individualized need. After deciding which pair of lenses could work best with your eyes, Dr. Mosaddegh will have you try on a pair of lenses to confirm the fit and comfort before finalizing and ordering your lenses. You will be provided care and hygiene instructions including how to insert and remove your lenses, how long to wear them and how to store them if relevant. Dr. Mosaddegh may request a follow-up appointment to check that your contact lenses are fitting properly and that your eyes are adjusting properly. If you are experiencing discomfort or dryness in your eyes, you may need to try a different lens, a different contact lens solution or adjustment in your wearing schedule. Whether or not you have vision problems, it is important to have your eyes checked regularly to ensure they are healthy and that there are no signs of a developing eye condition. A comprehensive eye exam will check the general health of your eyes as well as the quality of your vision. Contact Mosaddegh Eye Institute today at 415-392-4437 or sfeyedoctors.com to schedule an exam. Copyright 2018 Lillie A. Mosaddegh, MD. Site geared up by Gray Gear Graphics.